Sometimes you dream up a plan and it never comes to fruition. Other times it escalates. This was one of the latter. I had come up with the idea of flying over to Chamonix and shooting UTMB, the Ultra Trail Du Mont Blanc from the town, while taking my partner on a holiday. I received accreditation, working for Myoutdoors. However, a few weeks before I got a call from inov-8, asking if I would follow their athletes. Yes! What started as a break away with some photos in and around Chamonix, had turned into following the elite pack around the 100 mile course, across France, Switzerland, Italy and back to France over 24 hours…… Game on! The town had the atmosphere of a carnival, with street music, crowds partying and thousands of nervous runners lining up in-front of the famous church. Bumping into Doug, who I hadn’t seen for a year, we fought for our positions in the start line. we were soon to learn a media pass only gets you so far, its the armband which opens the best locations. After witnessing possibly the greatest start in the Ultra Trail calendar, it was off to the mini buses which would ferry us around the course for the next 24 hours. Heading through the valleys, ushered through police road blocks and into Saint Gervais. Saint Gervais Saint Gervais was 21km in and the pace was fierce. With runners entering the aid station, little time was spent before the push onto the mountains and into the night. La Balme Hiking as night settled in, the ascent to La Balme was gradual, only to be broken by the arrival of Zach Millar ahead of expected schedule, tearing up the fire road. At the top, elite runners rapidly refilled soft flasks, took on fuel and dispersed into the dark abyss ahead. Heading down the course, back to Les Contamines, the trail was alive with runners. As I kept stopping to take shots, which were always a surprise, given you couldn’t see the subject/s until the flash had fired and an image was loaded onto the preview screen, a mountain guide hurried me, as we had to be at the bottom to move on. Running down with 15KG of camera equipment and kit, dodging runners and taking further photos, I was glad to have been sent a pair of inov-8 TrailTalon 275 before heading out, to wear on course. It was on this descent I saw Nicky Spinks for the first time in fine spirits. Damian Hall and Jasmin Paris had passed me in the darkness already. Les Contamines was a party. A fire beside a bridge was the epicentre of cheers, with the church lit up with colour and locals stood creating a immense atmosphere. Once again, we made our way to the vans and onto Courmayeur. Courmayeur After waiting for an hour, I ventured into the back streets hunting for Zach Miller. Waiting for a couple of hours was tedious and the chance to bump into him early was exciting. Taking a wrong turn and backtracking, we bumped into Zach just in time to accompany him through the old streets. His legs were shot from the descent, yet he screamed on, calm as you like. Tim Tollefson all smiles! GBR’s Paul Giblin or Pyllon in the top 20 entering at 3AM. Back on the road we made it to the base of Grand Col Ferret around 4AM. And so the climb began. The idea was to reach the saddleback for the arrival of the 1st runners, as dawn broke over the valley. The climb of some 1hr 20 minutes was strenuous and uncompromising. A point and shoot would have been handy at this point. Rising through a cloud inversion, with the pinnacles behind piercing the nights sky, as the snow lined shafts reflected the moons light, it was awe inspiring to witness. Yet, instead of stopping, the assault on the mountain continued. Reaching the saddle, it was every layer on as a cold alpine morning started at 6AM. Grand Col Ferret And What a morning we were treated to. Our time was short lived, what goes up must come down and we had to move on. Passing Damian and Jasmin on the descent it was the first time I’d seen them since the start line. This time we really were running down the mountain, my shoes gripping on the dusty blown out trail. The heat was rising. Shade was welcomed by all, I was downing litres of fluid whenever I found a source. No where was this more obvious than at Refuge Bonatti, where runners submerged themselves in water in attempt to bring their core temperatures in the searing heat. After some 20 hours on the move, there was time to get something to eat before the leader was due to cover the final kilometre, through the streets of Chamonix. As crowds grew once more, the live tv link and announcer stirred the atmosphere, as music was amplified by the tall corridors of buildings. After the finish, the fall out, the celebrations, realisations of dreams and bodies relaxing, it was the following day which heralded the awards ceremony, timed to fall when the final finishers within the overall cut off. 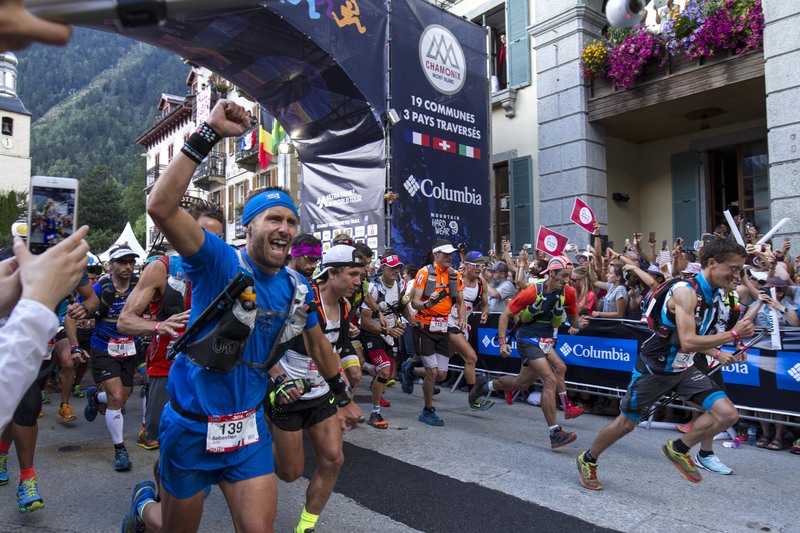 And it was at this time that the final finisher Laurence Dupont, who finished the 104-mile course in 1,468th placed 42mins, was invited to take to the stage. It is customary of the race to bring up the final finisher, in a celebration that treats all as equals, unifying the race. UTMB was and is something that has stuck with me. One day I shall enter one of the 5 races, but until then, shooting it was an endurance event in itself. I have nothing but admiration and respect for all runners, whether they took glory, made the cut off or had to pull out. Making the start line was a challenge in itself and one which they should be proud of. Thank you to inov-8 for kitting me out for the mountains and the opportunity. Thank you to MyOutdoors for the support over the past two years.